Tasting like chicken: its evolutionary origins. At least once a week, someone tells me that some food other than chicken “tastes like chicken.” People throw the analogy around constantly. Virtually any meat that is pale in color, firm in texture, and lacking a strong flavor is subjected to the chicken comparison. The range of species I’ve heard compared to chicken, flavor-wise, is very broad across the evolutionary spectrum: various birds, of course, but also snakes, lizards, small mammals, certain fish. 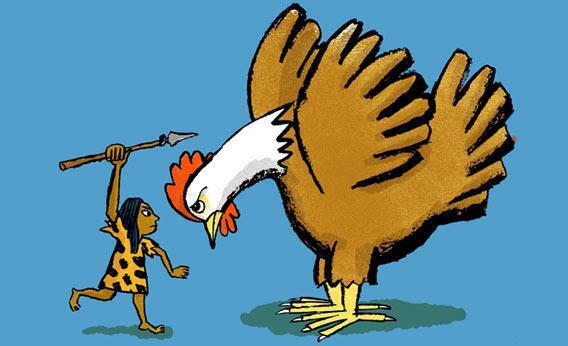 Which made me wonder: Can we trace the taste of chicken back down the evolutionary tree to a common ancestor? What was the first creature in evolutionary history that tasted like chicken? And for how long in the Earth’s history has life been tasting like chicken? Something had to come first, and I don’t think it was either the chicken or the egg. In order to answer this question, we need to start with chickens and work our way back through the evolutionary family tree. Does chicken taste like chicken? Don’t laugh—this is an important question. Even lifelong chicken eaters usually have a very narrow experience because the birds sold in grocery stores are usually one of a very few breeds that have been designed to grow a lot of breast meat very quickly in factory-farm settings. A Plymouth roasting hen slaughtered for market at 7 weeks does not make for the same eating experience as a 2-year-old Rhode Island Red. I once ate a bantam rooster that tasted more like iguana than a grocery store chicken. I posed a question for a group of friends on Facebook, asking them whether they thought Cornish game hens taste like chicken. Some of the respondents were adamant that the little birds have their own flavor and texture that hardly resembles chicken. What I didn’t mention when I asked the question was the fact that Cornish game hens are simply ordinary chickens slaughtered at a younger age. Our idea of what chicken tastes like seems to be as informed by our expectations as by our palate. A consensus has emerged in the scientific community that chickens and other birds are probably the direct descendants of dinosaurs. I have lost many good nights of sleep wondering what various species of dinosaurs tasted like, but the fact is that we don’t have any left to eat. Other than birds, the closest living relatives that we have to eat are the crocodilians, which date back to at least 250 million years ago. Looking back even further on the evolutionary tree, modern reptiles are related to chickens through a group of animals known as diapsids, which originated around 300 million years ago. Modern snakes and lizards are both descended from the diapsids—and as it happens, I have had the pleasure of eating a nice assortment of them: black spiny-tailed iguanas, green iguanas, and various snakes. What all of them had in common was a taste and a color after cooking that was like chicken, coupled with a texture reminiscent of crab meat. You wouldn’t mistake the texture of snake for chicken, but run it through a meat-grinder, and you wouldn’t know the difference. What chicken-reminiscent beasts existed before the diapsids? Now we must go way back in time to the first vertebrates that lived on land: the early amphibians. We don’t have any good fossils of these earliest land-dwellers, but there have been some well-preserved amphibian footprints dating back roughly 395 million years. The only amphibians still around today split off from the early amphibians around 300 million years ago. Frogs, the prototypical modern-day amphibian, taste definitively like chicken. Their texture is even like chicken. In a blind taste test, I couldn’t tell the difference. White meat, intermediate texture, mild flavor: It’s all there. This, along with the taste of snakes, lizards, and turtles, implies that tasting like chicken has been around for at least 300 million years. Looking further back in time to before the amphibians, we arrive at the fish. I’ve been told that many kinds of fish taste like chicken, but in practice I have never found this to be the case unless the meat is disguised in some way. Only last week I fried some fresh haddock in a beer batter and refrigerated the leftovers. The next morning I found that the cold fish tasted just like chicken—right up until I tried a bite without the breading. Then it tasted like fish again. My brain had been confused by an outer layer that reminded it of a chicken recipe. If there is one group of fish that can be considered more closely related to chicken than the others, it’s the lobed fish. Lobed fish are the class of fish that are popularly thought of as a missing link—the creatures that first became adapted to spending time on land and eventually evolved into amphibians. These types of fish usually had fleshy fins with articulated bones. They were very common during the Devonian period, but today lungfish and coelacanths are the only survivors. Coelacanths have hardly changed at all in the last 400 million years, but they are endangered today, which sadly takes them off the table. However, fishermen from islands off the coast of Mozambique used to eat coelacanths before scientists began paying them a premium for live specimens. The fishermen described the fish as oily and said the texture of the cooked flesh was unappetizingly soft unless it had first been salted and dried. This doesn’t sound like chicken at all. Lungfish are more appetizing to the Western palate than the coelacanth but still distinctly fishy tasting. One might cook with them interchangeably with cod or bass—but nobody will mistake the taste or texture for chicken. Why is this? Several barriers prevent fish from tasting like chicken. A chemical called trimethylamine, which develops after a fish dies and creates that distinctly fishy flavor and odor, is a big one. Texture also plays a role: Fishes’ muscle structure is different from chickens’. Fish muscles are typically arranged in bands along the sides of the body and are separated by relatively less connective tissue than what is found in the muscle of their evolutionary descendants. These bands of muscle are what make cooked fish flaky. Fish muscles are relatively simple because all they have to do to move through water is perform a sort of sideways flopping motion. The muscles of land-dwellers like chickens, lizards, and frogs are more specialized and are designed for the more varied movement of individual limbs. Neither the coelacanth nor the lungfish is the evolutionary missing link per se, but both are solid living representatives of the group of species that amphibians, reptiles, dinosaurs, and chickens are all descended from. If the lungfish or the coelacanth’s meat is representative of lobed fish in general, then we can surmise that meat probably didn’t start to taste like chicken until the transition from fish to amphibians occurred. 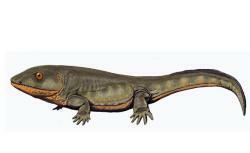 The first known species to make that transition from water to land was Pederpes finneyae. P. finneyae appeared about 350 million years ago and was the earliest creature in the fossil record to have the forward-facing feet of a fully terrestrial animal. Assuming the transition from water to land necessitated the complicated muscle structures we see in today’s land creatures, then P. finneyae probably would have been an excellent candidate for marinating in lime juice and cilantro and then cooking and shredding for tacos. So roughly 350 million years ago is probably when life began to taste like chicken, right when some lobed fishes had fully transformed into the first terrestrial amphibians, like P. finneyae. It’s hard to imagine that this trait has had any advantage for the animals that exhibited it, given that the only situation in which flavor is expressed is when the organism dies. (In fact, considering that we generally like the taste of chicken and go out of our way to kill chickens in order to taste them, you could say that tasting like chicken is a distinct disadvantage.) But it would appear that the taste has nonetheless persisted for hundreds of millions of years. So maybe instead of saying that the next pale, firm, mild thing you eat tastes like chicken, you should say it tastes like Pederpes finneyae.